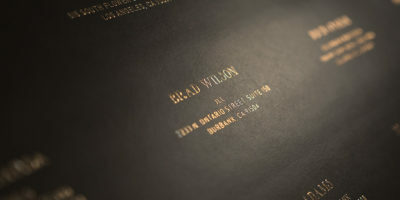 Embossing can add a special touch to your print materials. Whether you use foil or paper, embossing raises an image slightly above the rest of the page, lending an elegance to an invitation, postcard, letter, or other type of promotional item. At Embossing Plus, foil and paper embossing is one of our most popular printing requests. We’ve become known for our speedy turnaround in our other finishing projects, but the die-cut that’s required to create an embossed print item slows down the process. To emboss an item the traditional way, we must first create a die and then make a print from that, a process that often takes an extra two days. We also must get the customer’s approval on the finished look of an embossing, which can delay the final product even further. All that is about to change. Recently, Embossing Plus became the first print shop in the country to own a JETvarnish 3D Evolution (EVO) printing press. The EVO is an innovative machine that can create a high-quality embossed product in a matter of minutes. Made by Konica Minolta, the EVO can print up to 3,000 ISO B2 sheets size per hour with the flexibility necessary to input a variety of print jobs. Best of all, the final output from the EVO is as visually-enticing as traditionally-printed embossed media. Not only does this mean that businesses can get the print jobs they need within days of conceptualizing them, but they have a finished product that wows customers. This high-quality output with fast turnaround is what has always set Embossing Plus apart from the competition. The EVO moves the embossing product from traditional printing methods to an entirely digital format. 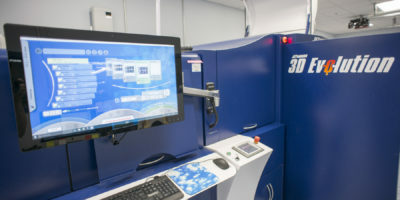 No screens or dies are used in the materials created on the EVO, and print jobs can be set up on the screen. This allows Embossing Plus to show our customers an instant view of the final product before it goes to press, letting them make changes on the screen instead of waiting to see a proof. This eliminates the slowdown that comes during the approval process, ensuring customers have their materials without the wait. The ability to make changes on press also saves money for everyone involved. Instead of making major corrections after a mold has already been made, Embossing Plus can make those adjustments on the screen, with the customer continuing to provide input until they have the exact look they want. Digital technology has changed the way materials are printed, creating a print-on-demand market that has led customers to expect immediate results. 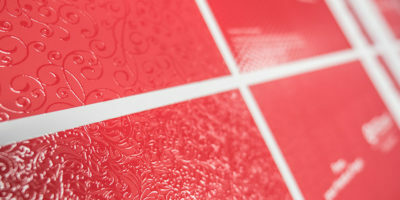 With the EVO, Embossing Plus can now offer finishing on demand, which will likely encourage more customers than ever to add special finishing processes to their projects. Embossing Plus remains committed to providing high-quality print output with a lightning-fast turnaround. As the first company to own a JETvarnish 3D Evolution, we’re the first finishing service provider in the industry to be able to offer fast turnaround on embossing projects. Interested in how this amazing machine can bring your next print job to the next level? 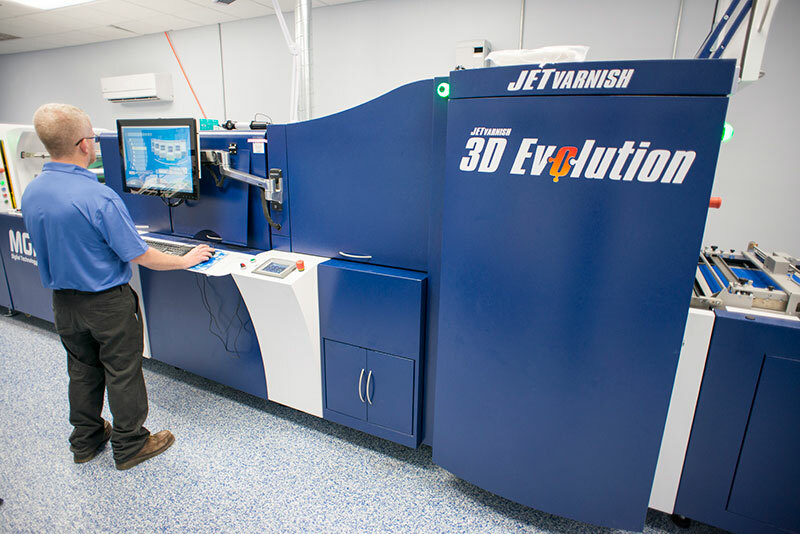 Contact us to learn more about the JETvarnish 3D Evolution.